Malaga is an ideal location to learn Spanish if you are seeking to experience as much culture, fun and adventure as possible during your time in Spain! 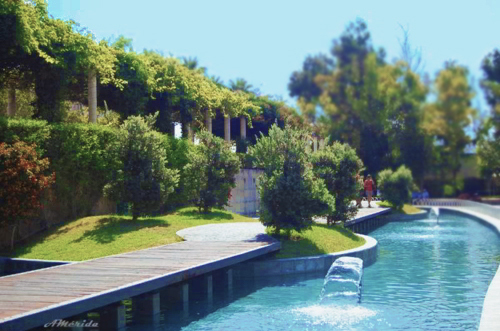 As the capital of the ‘Costa del Sol’, it lives up to these expectations by having 340 days of sun every year. The rich history of the city blends perfectly with the more modern aspects, making Malaga one of the most interesting and versatile places to explore and travel in Spain. 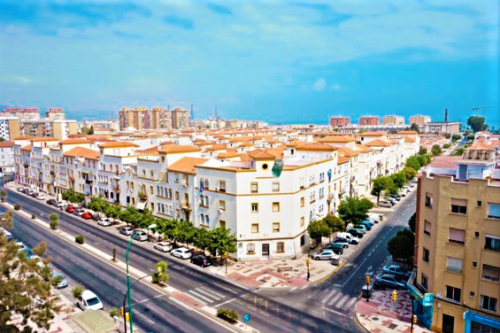 AIL Malaga is located in an area of the city where real people live, work and thrive each day. The streets are lined with family-run bakeries, fruit shops, cafés and whatever else you might possibly need to reside comfortably alongside the locals. Studying in a part of Malaga that is so unapologetically genuine will not only enhance language learning skills but will also help visitors to gain a more complete understanding of Spanish culture and lifestyle. By integrating yourself into the local community, you create your own immersion experience, which is arguably the best way possible to learn a new language, or pursue fluency. Other benefits of doing a Spanish course in an area of Malaga like this one is that there will always be things to do and places to explore that the tourism guides will not tell you about – you will leave the capital of the “Costa del Sol” having had a completely unique experience. Of course, the option remains to partake in as many popular tourist activities as you like. Malaga is one of the oldest cities in the world, offering a lot of history to visitors. The magnificent Cathedral in the centre is one of many historical gems that the centre boasts, as well as the Gibralfaro Castle and ancient Roman Theatre. However, the city has kept up with the times and provides a range of more modern things to do, like the segway tours of the city and a ride on the big wheel. Malaga is a place that can truly be confirmed as having something for everyone. The city centre is surrounded by beautiful mountains and long stretches of beaches, presenting stunning views to those who seek them. A variety of museums are dotted around the area, amidst endless shops, big and small, traditional cafés and restaurants creating classic Malagueño cuisine and bringing flavours from all over the world to the city. There’s plenty to explore, no matter what you’re looking for. The ‘Costa del Sol’ is famous for its remarkable beaches along the southern coast of Spain. Visitors can enjoy the beaches and Mediterranean Sea in Malaga’s warm summers, but also come and visit us during our pleasant winters. AIL Malaga school is just a 10 minute walk from the Misericordia beach, which is populated with many ice cream parlours and chiringuitos. 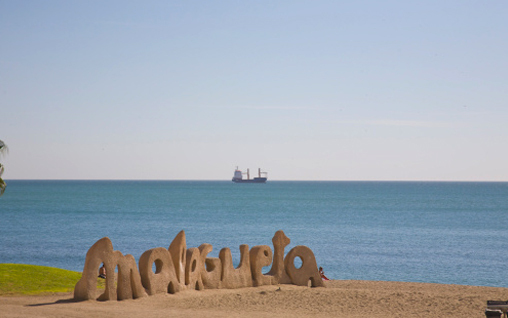 Fans of the centre of Malaga can take a break from shopping and absorbing what museum exhibitions have on display at the Malagueta beach, one of the most popular beaches in all of the ‘Costa del Sol’. The sand and sun stretches for miles and miles, so there’s plenty of choice. The sandy shores are perfect for relaxing, or even playing summer sports like volleyball. Another popular choice for visitors is the beach in Torremolinos, called ‘Los Alamos’, famous for its relaxing daytime environment and thriving nightlife. Just don’t forget to bring suncream and a towel! The location of the school enables students to plan many activities, most of which are conveniently close by. There are a number of shopping centres around Malaga, but two of the best in the region are a few stops away via the metro or about a 20 minute walk for those who wish to travel by foot. The Larios Commercial Centre and Maria Zambrano train station are next to each other with an impressive list of shops and restaurants inside. 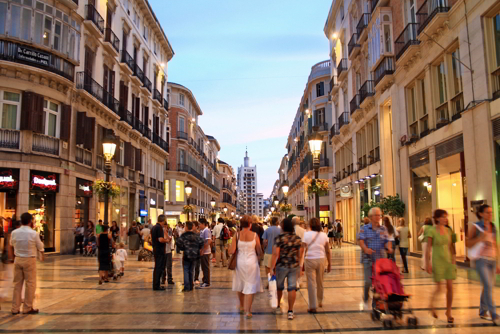 For shopaholics, the main street Calle Marqués de Larios in central Malaga will not disappoint. There are a number of cinemas, theatres and venues around Malaga hosting all kinds of performances, such as stand-up comedies and traditional Spanish flamenco dancing for those who like a show. Another good option for groups would be one of the bowling allies, Divernostrum or Bowling 80. You can also find many ‘salones de juegos’ in Malaga, which are essentially gaming arcades. There’s also a lot that visitors can do here without the necessity of spending money. A short walk away from the academy will lead students to the Parque del Oeste, a beautiful park with plenty of quiet spots to sit, unwind and take in the greenery, but with more open spaces to run and stay active. Competitive students may enjoy a game of football or basketball in one of the many public multi-use courts also nearby the school. 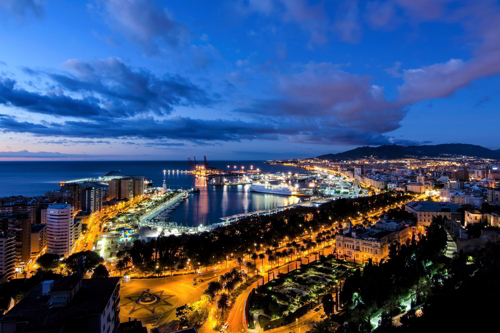 Malaga is home to many amazing places to eat and drink, so the amazing nightlife shouldn’t come as a shock to visitors. 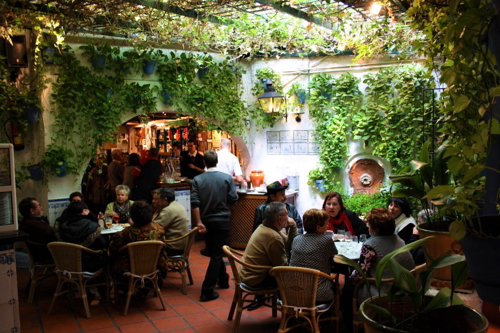 Restaurants offering tapas are everywhere, the bars all serve a selection of classic Spanish beers. El Pimpi in the centre is famous for its wine, beautiful layout and popularity with celebrity clientele such as American actor Jason Biggs, world-famous tennis player Rafael Nadal and Malagueño actor Antonio Banderas (who loves the iconic restaurant-bar so much that he bought shares in it in 2017). Keep in mind for later on in the evening, there are a number of popular nightclubs which are open until 7am for those who think they can handle a true immersion experience! For the morning after, it’s very easy to find places offering the traditional breakfast churros with chocolate, (or Malagueños Tejeringos) which are even more delicious here, homemade in Malaga, than the versions sold across the world in supermarkets. They are a well-loved staple of Spanish cuisine that must be tasted before leaving Malaga! Another factor that is crucial to the appeal of Malaga is the simplicity of public transport in the city. Buses run all through the day and night, even on Sundays and many public holidays. 20 minutes on the bus from the school will take students straight to the city centre. For students less confident on the buses, the metro is very easy to figure out and use. In fact, everything is so close by that even taxis are often an affordable option. A taxi ride from the airport tends to only cost around 20€. The main train station in Malaga can take visitors with wanderlust to explore other beautiful places, such as the white villages (“pueblos blancos”) including Benalmádena, Mijas or Ronda, and stunning cities like Granada, Cordoba and Sevilla. The ‘pueblos blancos’ show off a prettier and brighter side of Malaga that you wouldn’t find in Spain’s cities. The port at the centre even offers trips to Morocco and Gibraltar by ferry! The opportunities to explore more of Andalucia and surrounding areas are straight forward and seemingly endless.